Sponsored By: Dr. Gary Fowle, O.D. Please help your coaches fill their Concession Stand team volunteer time slots. General Information: The RLL Concession Stand is staffed during regularly scheduled games at East Rockford Middle School. We have a variety of menu options available, please see our current menu below. At least one regular Concession Stand employee works during every shift to provide training, hour-by-hour operational support, etc. 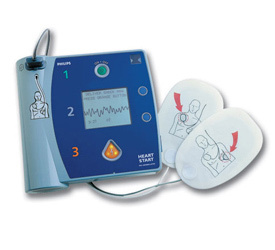 First Aid: The Concession Stand has an AED (Automated External Defibrillator) for emergencies. Please come to the Concession Stand window in case of emergency. We also stock a small supply of bandaids, wraps, ointment, and ice packs for minor injuries. Each team is assigned one or more “shifts” at the Concession Stand during the regular season. We ask for three volunteers from each team to work the entire shift, which minimizes our training times, and keeps food moving as quickly as possible to the parents and Little Leaguers. Please remember that since we do have some “hot” equipment in the Concession Stand, we would prefer for volunteers to be 16 years old. Most shifts are scheduled on a night when your Little Leaguer does NOT have a game, so you don’t have to miss their first Double-Play or Home Run! What Can I Expect When Volunteering? It’s mostly fast-paced, as you probably have seen if you’ve purchased from the Concession Stand in the past. We have positions that take orders/money, stock beverages, make popcorn, make hot dogs, and more! You will get training when you arrive. It’s a good place to meet your fellow League members, and even catch part of a game from one of the windows. Remember to wear comfortable, closed-toe shoes, clothing that can withstand some food encounters, and keep in mind that long hair needs to be pulled back in a pony-tail or under a baseball cap. Why Should I Volunteer? One of the many ways in which we keep RLL Registration Costs for players from rising significantly is relying heavily on volunteers, and the Concession Stand is no different. The dollars raised through the Concession Stand are returned directly back to Rockford Little League in terms of field maintenance, equipment, technology upgrades (like this website), etc. Also, having food and beverages available to the Little Leaguers and their parents is very welcome when we’re all so busy! On any given day of activity at the RLL complex, we can have as many as 500 or more people at the fields. We really need your help. How Do I Know When to Volunteer? Your coach should be in contact with you to request volunteers. Please reply to him/her as soon as possible. Also, you can review your team's schedule page where you would go to see practice and game schedule information. Look for the events of the type “Concession Stand.” We also welcome any volunteer at any time. Thank you for supporting the RLL.